For eight long years, this dog named Bron lived in a world dominated by sadness and pain — but in an instant, that all changed. Bron had spent his entire life chained up on a farm in Spain. When he was finally discovered by volunteers from Animal Rescue España, the dog's weakened body was host to a number of untreated injuries, telltale indications of abuse and neglect. But most pronounced of all were the unseen wounds of having never been loved. 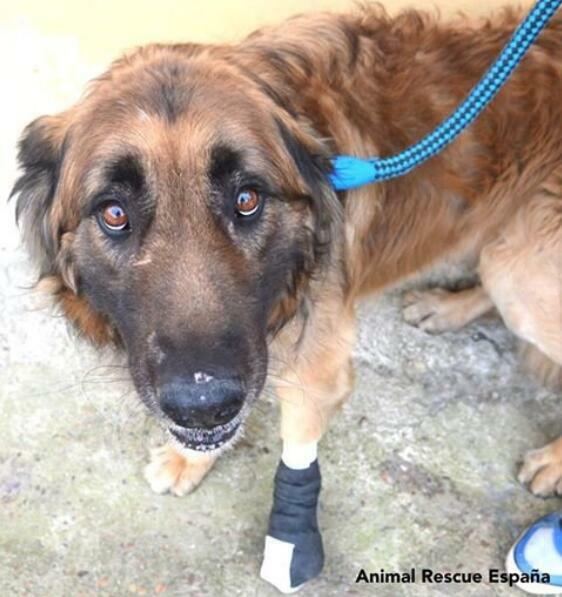 "Bron is one of the most difficult cases we have encountered," rescuer Pilar Delgado told The Dodo. "When we first approached, he would flee, snarling." Even once he was brought to safety, Bron was slow to let his guard down, but rescuers never stopped trying to earn his trust — and their persistence paid off. In a tender moment captured on video, Bron finally allowed himself to be petted for what may have been the first time in his life. That first experience of human warmth and affection was a welcome revelation for Bron, but helping him overcome the years of trauma has been a longer road still. For the better part of a year, he's been working with an expert dog trainer to prepare him for a forever home. "He is a happy dog, but he still has barriers to overcome," Delgado said. "Bron's heart still hopes that, despite all the difficulties, he can live out his days with a family."